The Polish EGP was held in the beautiful city of Krakow, on the 20th - 21st of September. 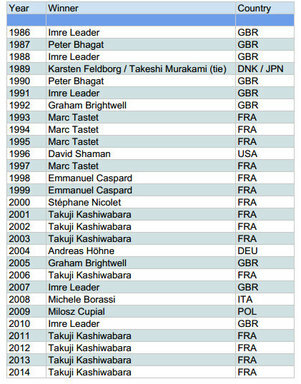 Will Takuji Kashiwabara win the EGP for the 8th time? That would be a fantastic achievement! But maybe Marc Tastet will win for the 5th time. The last time Marc won was in 1997, it would be great for him win again after 17 years. 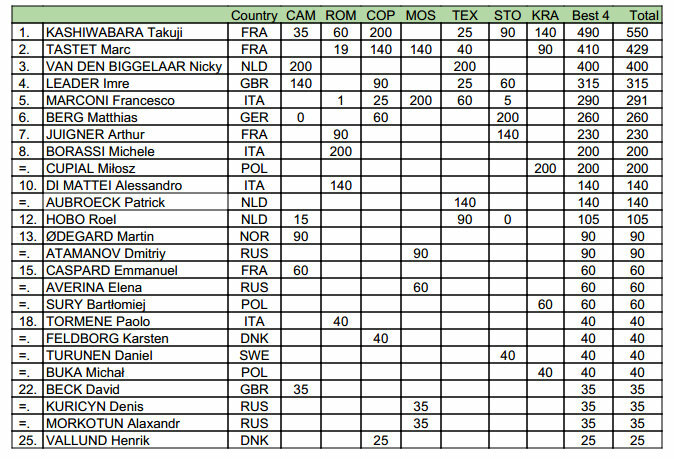 Only 5 players at this tourney, absent top of the EGP 2014: Nicky van den Biggelaar, Imre Leader and Francesco Marconi. 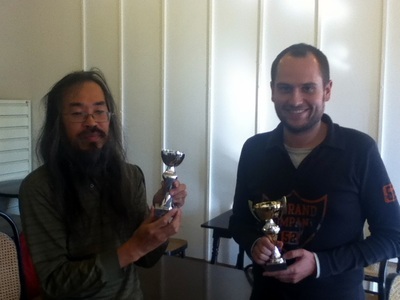 The players agreed to play a double round robin + final. 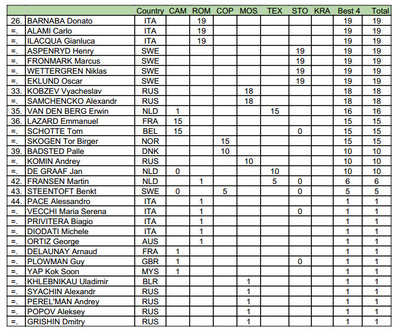 In 2013 we had only 5 players who played 4 or more of the EGP tourneys, this year we have only four. What needs to be done to attract more players? A perfect score for Takuji Kashiwabara on the first day, 3 more rounds to play tomorrow. Will he win 3 more games? I am sure he will be one of the finalists. Who will be the other finalist? Miłosz Cupiał has 5 points and will play against Michał, Takuji and Bartłomiej. Marc Tastet (4 points) has a bye and plays against Michał and Takuji. Bartłomiej (4 points) also has a bye and will play Takuji and Miłosz. Good luck to all on day 2! 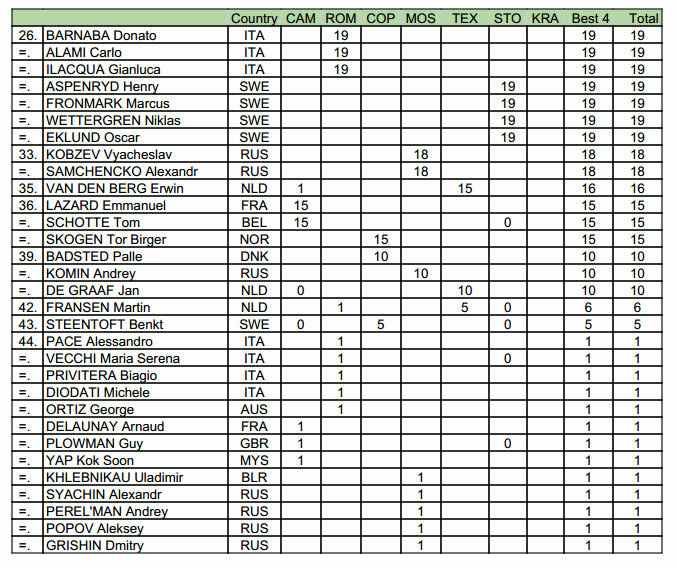 The second day of the EGP Krakow, three more rounds to play and the final. 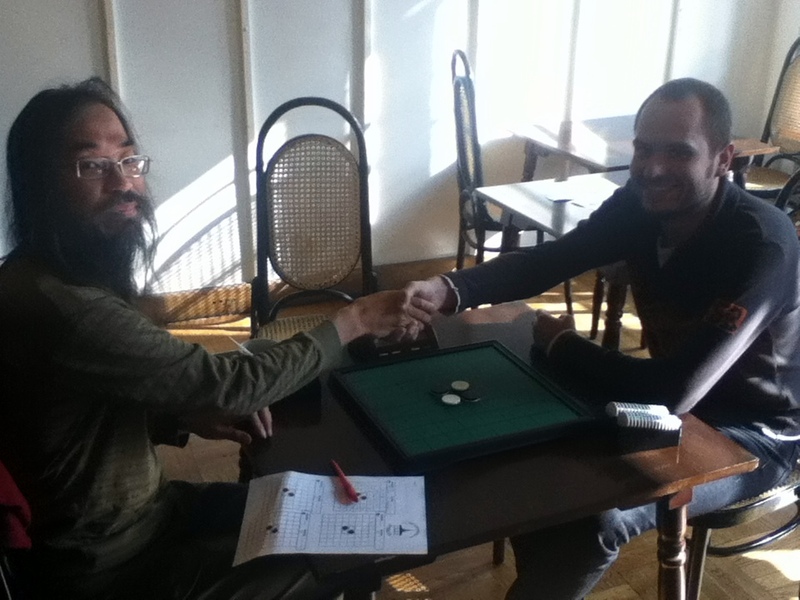 Round 8: Takuji won his game in round 8 against Bartłomiej. Runnerup after 7 rounds, Miłosz Cupial also added a point to his total score as he defeated Michał Buka. Marc Tastet had a bye. 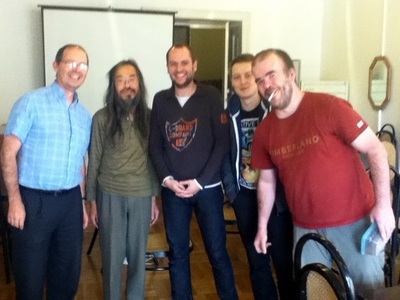 Round 9: surprise , surprise, Takuji lost against Miłosz. Marc Tastet won his game against Michał Buka. Round 10: Marc Tastet 17 - 47 Takuji Kashiwabara and Miłosz Cupiał defeated Bartłomiej Sury. 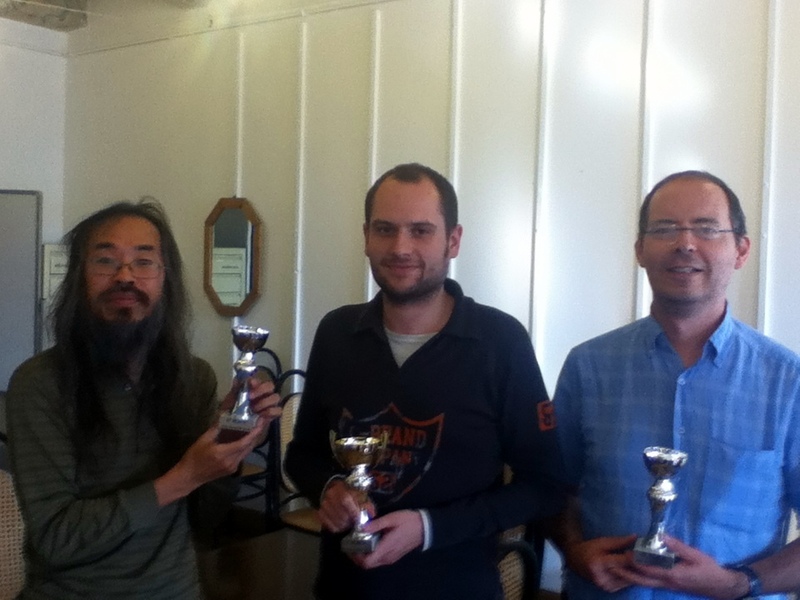 Takuji Kashiwabara is finalist of the EGP Krakow and EUROPEAN CHAMPION 2014. Congrats Takuji! 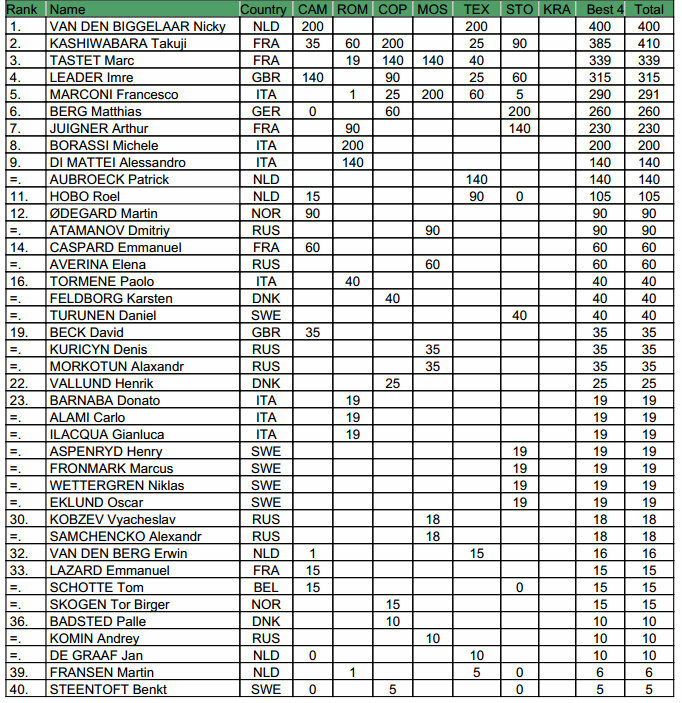 If Marc Tastet wins the playoff for 3rd place, he will finish second in the EGP 2014, if not third. The other finalist is Miłosz Cupiał, the 2009 EGP champion. 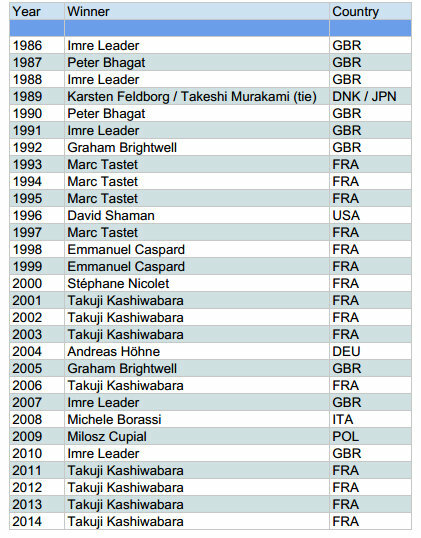 In 1992 Marc Tastet was 1st in Milan, 2nd in Paris, 3rd in Cambridge, 4th in Brussels, 5th in Copenhagen. I know Takuji is very fond of number sequences, I bet he is very happy his sequence is even better. Marc Tastet commented that after his EGP victory in 1992, he also won the World Othello Championship. So this should be a good omen for Takuji. Marc wrote "Why not win the WOC this year? Do not miss your turn because next year it is that of Arthur Juigner to break the record of Kunihiko Tanida as youngest World Othello Champion". 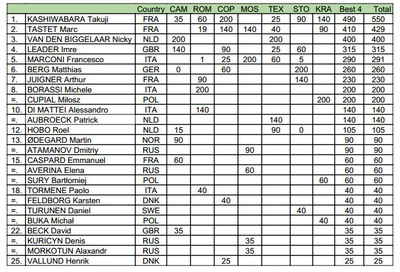 The French seem really anxious to set some records, but as far as the WOC is concerned, Othello News says "Go Nicky go!